Scalp psoriasis is a common skin disease that creates a reddish raised patch of scaly skin. This can occur in one single patch, several different spots or affect your entire scalp. This rash can spread across the forehead, behind the ears and down to the back of the neck. Scalp psoriasis is not contagious. You can not catch this disorder from another person. 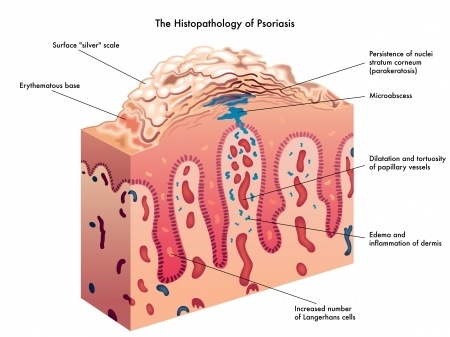 as with other types of psoriasis, it is unclear what causes it to happen. Doctors believe that it appears when something is wrong within the immune system and causes the skin cells to grow extremely quickly, thus building up into flaky patches. You will be more likely to develop scalp psoriasis if someone in your family has it. About half of nearly 7.5 million Americans suffer from psoriasis on the scalp. In many cases, the scalp is the only place a person develops psoriasis. Scalp psoriasis can come in different levels fo severity. You can develop mild and almost unnoticeable psoriasis, or it can be very severe and last for a extended period, causing thick crusted sores and very intense itching. Scratching a lot can lead to hair loss as well as skin infections. Scaly red bumpy patches of skin. Scalp psoriasis does not lead to hair loss itself, but hard and constant scratching does. Picking at the scaly spots and including harsh treatments with stress on the hair follicle cells will result in temporary hair loss. Thankfully in most cases the hair will grow back after the skin clears up. If you have any of these symptoms, you should see your doctor or dermatologist immediately He or she may conduct a skin biopsy and rule out other conditions such as seborrheic dermatitis. Over the counter products will contain, one or two medications that are approved by the FDA including Salicylic acid and Coal tar. Antimicrobials, this treat bacterial and yeast infections that come with scalp psoriasis. Anthralin is a prescription medication that has been out for some time now. In order for these treatments to work, they need to be used on the scalp of the head, not only hair. You should follow the directions of the medication until the scalp heals completely, This can take eight weeks or longer. Once the psoriasis has cleared, its best to keep shampooing daily or twice a week with coal tar or other medicated products. With a case of mild scalp psoriasis, where it only occurs in a few spots, your doctor or dermatologist may inject steroids directly into those areas. If the psoriasis systems do not respond to these treatments, phototherapy may be an option. It uses high-intensity laser and nonlaser light sources on affected areas and avoids the healthy skin, in the sorrounding area. Ultraviolet (UB) may help; it is delivered with a handheld UV comb, that can treat the entire scalp. IF you are bald or have thin hair going out into the natural sunlight for short periods may be recommended. If you are suffering from a moderate to severe case of this disorder, your doctor may prescribe you oral medications or injected medications. Since these drugs can cause serious side effects such as liver damage. They require that the doctor watches over the administrating of these drugs very closely. Oral vitamin derivatives are not the same as vitamin supplements. They are much more powerful, and vitamin A and D supplements will not help. The most recent drugs approved by the FDA are called biologics. These are taken by injection or IV; they may help prevent the skin from producing too many cells. ← What are Peptic Ulcers (Stomach Ulcers)?